I give these 3.5 out of 5 stars. Knowing that the reason they didn’t score higher is likely because this was the first time I tried making these. The seasoning was SPOT ON! (Confirmed by another family member.) 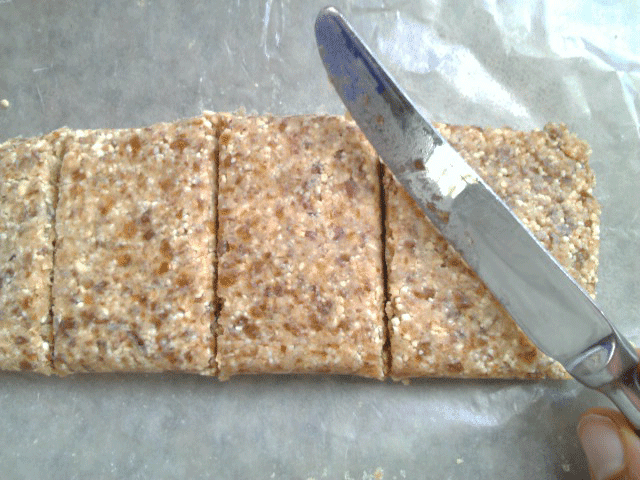 Yet, the texture or crunch was not quite right. I intend to try various tortillas to get the desired outcome I’m looking for. Preheat oven to 375 degrees. Use convection setting if available. Add all seasonings to a large bowl and mix/whisk well. Set aside. 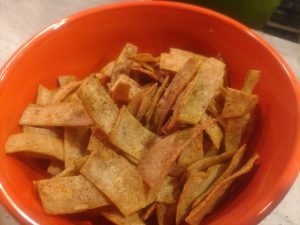 Use a pizza cutter or kitchen scissors to cut the tortillas into Frito-sized strips. To accomplish this I cut the tortillas first into three parts using two horizontal cuts. Then I made the vertical cuts which resulted into the perfectly sized strips. Place corn strips onto a baking sheet. I covered the baking sheet with parchment paper. Add oil and toss the strips around to get them thoroughly coated in oil. Bake for 12 – 15 minutes until crispy and be careful not to burn during the last couple of baking minutes. Remove from oven and immediately toss the tortilla strips into the bowl with seasonings. Something to consider: I think the next time I make these I will toss in the seasonings before baking. I season my sweet potato bites prior to baking and I think these will turn out just fine too. This way, I believe the seasonings will stick to the chips much better (without the need to add any additional oil). I will report back to you on this in the near future. If you try it, let me know what tortillas you used for this recipe. Happy crunching! 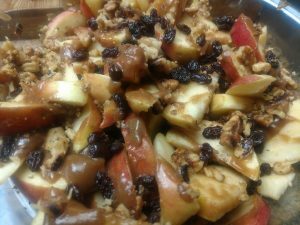 Cut the apples into thin wedges, arrange on a platter, pour on sauce and add toppings. Note: This was adapted from the ‘Apple Nachos’ recipe from the Medical Medium’s website. 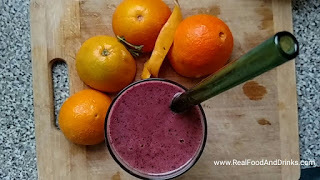 Lately, this has been my “go to” morning smoothie to “get going”. 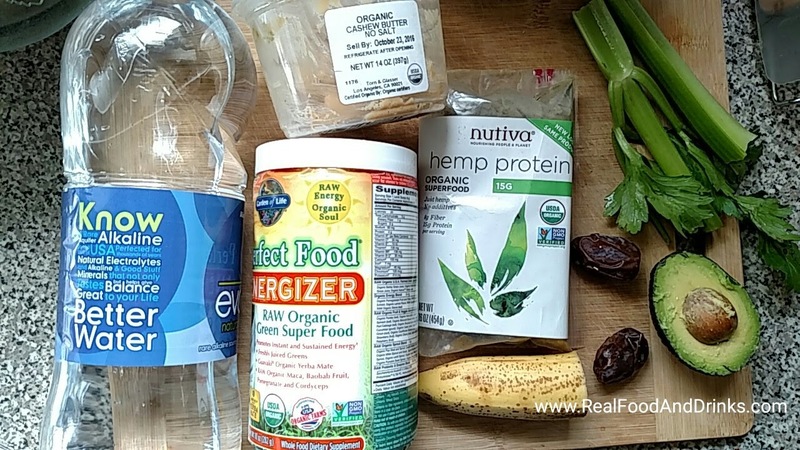 Add all ingredients to a high speed blender. 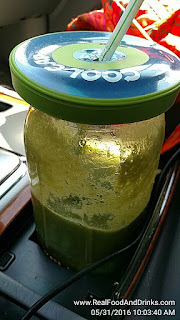 I use a Vitamix – it’s my favorite. 2. 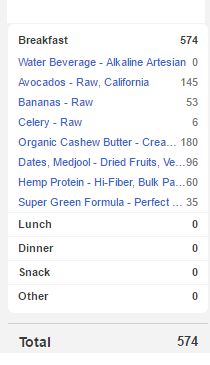 I’ve been using organic cashew butter, but I also like almond butter. Almonds are the only alkaline nut and, by the way, cashews aren’t actually nuts. 4. Add even more “green power” by adding fresh leafy greens (spinach, kale, salad mixes) – you might want to add a a little more liquid if you do. Below are the results from a calorie counting program. Calories: The calculations show 574 Calories. I need all the “healthy” calories I can get. But, if you want less calories, start my removing the nut butter before any avocado. This morning it took me a while to get around to preparing my first meal around 11 am. I had already had 32 ounces of water (mixed with barley green powder and 1/2 of a lemon which has now become my regular morning routine.) But at this hour of the morning, I felt like I wanted more than just juice. So I mixed together this quick smoothie. You can use frozen pineapple, mango* and/or blueberries which are easy to find in the frozen food section of the grocery store these days. Actually, I purchase most of my blueberries frozen because that’s almost the only way I find organic berries. But I prefer fresh pineapple and fresh mango, especially the Ataulfo mangos that are plentiful in the beginning of summer time. This recipe will make 28 – 32 ounces and can easily be doubled. 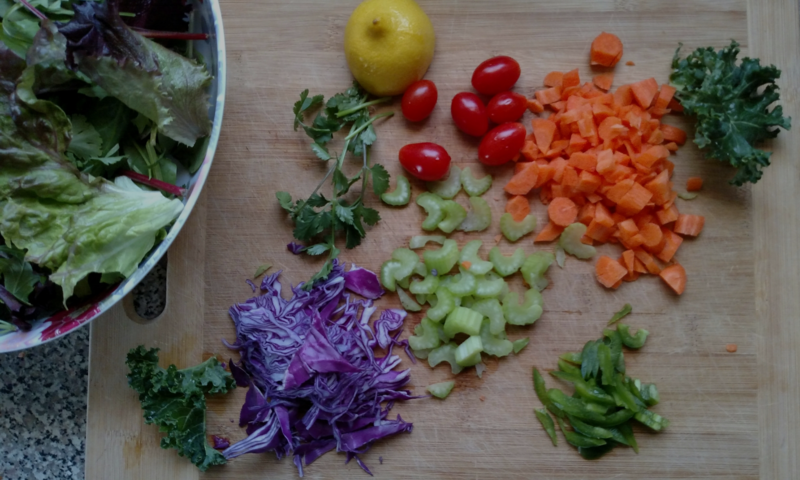 *High FODMAP food – remove from ingredients to achieve a Low FODMAP recipe. I added a handful of greens (kale & spinach are my favorite). 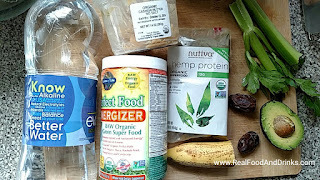 Place all ingredients into a high speed blender such as a Vitamix and blend until smooth. 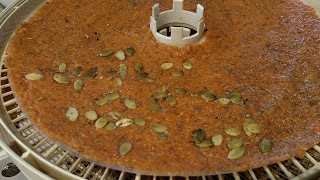 Spread onto teflon sheets of a dehydrator and follow dehydrator’s instructions. I set my Nesco dehydrator at 135 degrees F.
Note: Sometimes I set higher … depending on how quickly I want to eat these. These can be dehydrated at a temperature lower than 115 degrees F to preserve enzymes and if you still want to consider the crackers to be RAW. 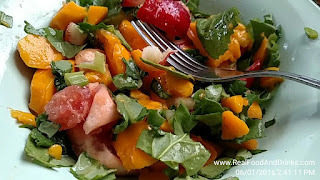 This recipe was inspired by Fully Raw Kristina’s ‘Spicy Mango Basil Salad’ from the Fully Raw Diet book. 1. Pop the kernels in your air-popper, following directions for use. 2. Melt coconut oil & drizzle it on the popped corn. 3. Sprinkle with turmeric & salt. Enjoy! I use a POPCO Popcorn Popper to make popcorn. I am not normally an advocate of the microwave, but when it comes to making popcorn I am. I can make oil-free popcorn easily using this popper. Important note: I only recommend air popped or a microwave popper so that your popcorn can be prepared without oil. Oils add calories and extra fats of a type that works against the liver. 4. Eat directly from the bowl or transfer to another heat safe bowl. NOTES: Oil-free popcorn is ideal because oils can cause adverse reactions for those with IBS. In fact, it’s not recommended that you eat popcorn while experiencing painful IBS symptoms, but once you get your symptoms under control, popcorn makes a good snack. Most can have up to 7 cups popped. Since popcorn is a grain it should be avoided while on all healing diets. Yet, popcorn is a great REAL FOOD snack when prepared at home using fresh, NON-GMO, and organic ingredients. It was the most difficult grain for me to “give up” while healing, but it was definitely worth the wait. 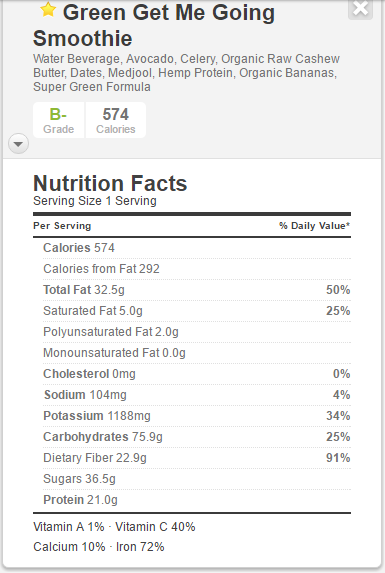 Potato chips are not currently in my diet because potatoes should be avoided on the GAPS, SCD and Candida Free Diets. So, when I want something crunchy other than my homemade crackers, I make kale chips. I’m saving so much money by making them on my own also. Additionally, I prefer to make them myself because I know exactly what I’ve put into them and I can “mix it up” based on my own preference. 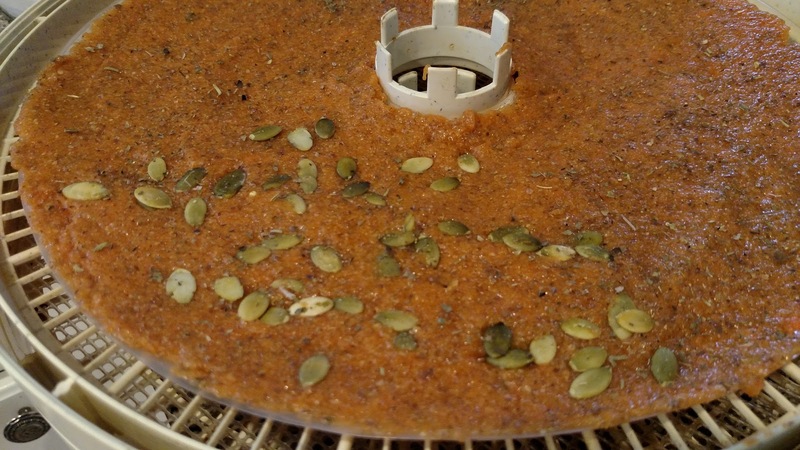 Ideally for best results, you should use a dehydrator – but an oven will work too. These are YOUR home-made Kale Chips. So many of the ingredients listed below are optional including the nuts, but they do add a special crunch when used in a recipe. Add seasonings/spices to taste and any combination that you like (keep them light, will be stronger once dehydrated) Listed below are some that I use often. 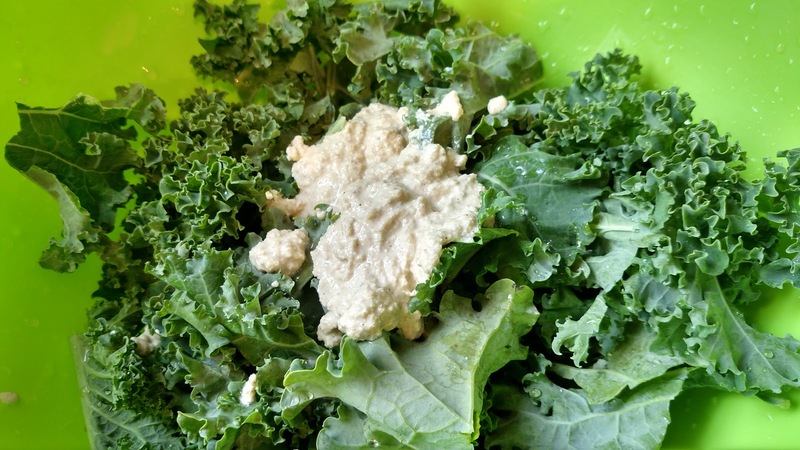 Add everything except for kale to a blender or food processor. Taste your recipe. Remember the flavor will be a bit stronger when dehydrated. Add just enough water, if needed, to enable you to pour your flavor mixture over the washed kale – kale does not need to be dried. The water will evaporate. Massage the mixture into the kale. They might begin to look a bit wilted, but that’s OK. 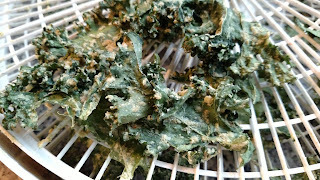 Spread the kale onto the dehydrator and dehydrate between 105 and 135 degrees Celsius. ANOTHER OPTION: You can add some Kale to one of the flavor mixtures which includes nuts and spread the paste onto a baking sheet to make homemade crunchy crackers. 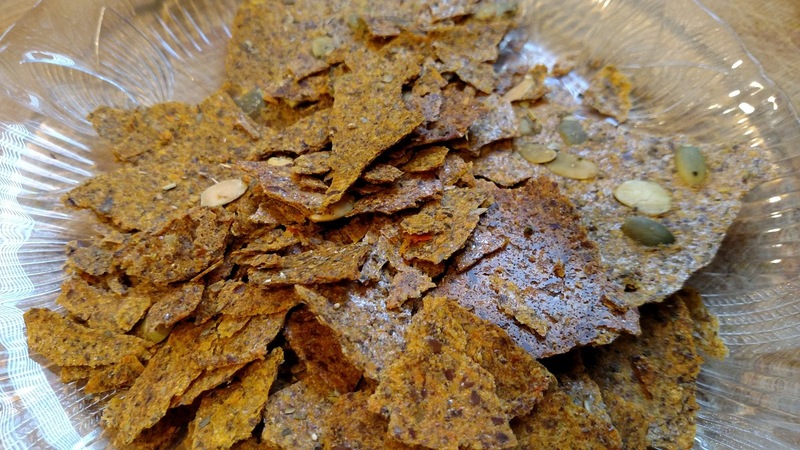 By adding nutritional yeast and a little cayenne, you just might end up with some "Cheez-It" type snacks. My dehydrator is by Nesco. I purchased it from Kohl’s for about $35 (year 2012) or less when I used my Kohl’s coupon. I haven’t had the privilege of trying an Excalibur dehydrator. But this one does just fine. After 3 weeks of waiting, I finally got to try my lactofermented cucumbers (vinegar-free pickles). I’m not even a pickle eater, but I will eat these because they are a healthy snack due to the Lactobacilli (live bacteria) benefits they provide. This food will help heal my digestive system. 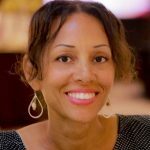 The recipe is from the Internal Bliss Cookbook designed for those following the Gut and Psychology Syndrome diet. All recipes are grain-free, refined-sugar-free, and lactose-free. optional: 2-3 cloves garlic*, peeled; 1 tsp coriander seeds; 3 bay leaves, raspberry, currant or grape leaves; 1-2 small hot red peppers (dried is fine); 1 Anaheim or sweet green pepper*, seeded and sliced. Peel and cut the onion in quarters. If you are using small whole cucumbers, poke a couple of holes in each one with a sharp knife. Cucumbers should be a consistent size. Pack the cucumbers tightly into the jar with your choice of seasonings. Make a brine of 2TBS sea salt per quart of filtered water. Pour over vegetables. Make more if necessary to fully cover the cucumbers. Put the lid on, but not tight. Put the jar onto a plate or something to catch any liquid that might bubble over. Put into a dark cabinet for one week. After the week of fermentation, remove leaves, cap jar and place into the refrigerator for two weeks to mellow. 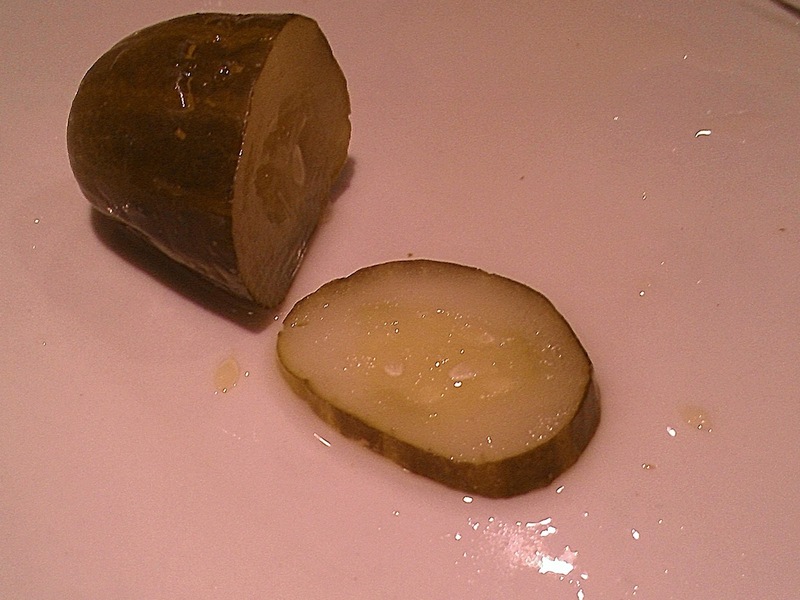 Note: Just like the book warned that there might be a layer of white yeast (kahm yeast) which shows up – my pickles did have this yeast. But it was nothing to worry about and it did not affect the pickles in any way. They were really good on my “bun-less” grass-fed burger with homemade ketchup. 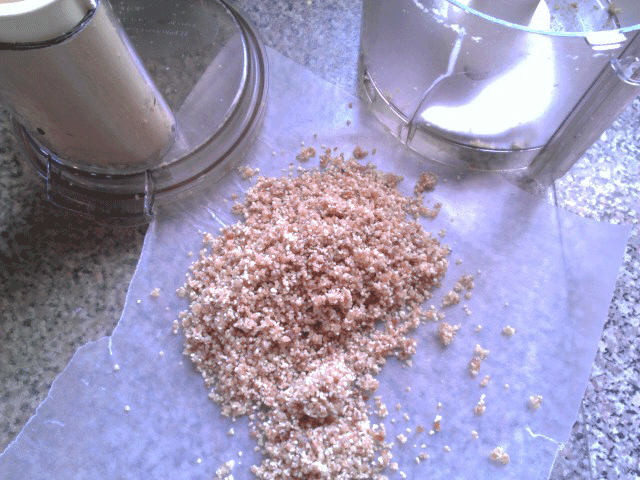 Homemade Larabars! 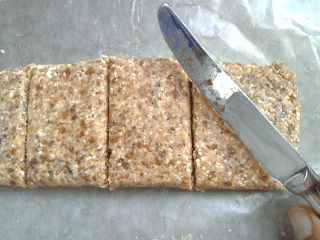 A great snack without any processed sugar…only nature’s best! Pulse cashews and dates together in food processor using equal quantities (dash of salt – optional). Shape into a bar and enjoy. It’s that easy and YUMMY! Most Larabars are made using cashews, almonds and/or pecans plus dates and other fruits. The dates help the bar hold together because of their moistness. Dates are an excellent source of potassium and other important vitamins and minerals.